I absolutely love handbags! Seriously. Some women buy shoes- so many pairs that they probably don’t even have room in the closet for them! (You know who you are! *wink*) Others buy clothes, and I’ll bet there are many items in their closets that are still sporting the department store or boutique tags! I buy handbags. Oh my, I don’t even know how many I own, but I can tell you this- I am a handbag-a-holic! I can’t resist buying them. Lately, I love the handmade bags found on Etsy. One of my new favorite stores right now is RECLAIMING AMY. RECLAIMING AMY is one of the newer Etsy shops, but don’t let that stop you from buying from Amy! Her handbags are beautiful and made of fabrics that have been recycled to live a new life in a stylish, well-constructed handbag. Therefore, no two bags are alike. The purse I have from RECLAIMING AMY is made from a reclaimed skirt and recycled purse straps/hardware. I fell in love with it the minute I saw it, and let me tell you, it is even more gorgeous in person! The exterior fabric is strong, yet soft. The interior is fully lined with a coordinating fabric, and there is a cell phone pocket and a zippered pocket inside as well- great features for someone like me who NEEDS organization! • RECLAIMING AMY makes quality handbags. • RECLAIMING AMY handbags are ECO-FRIENDLY, made from recycled materials. • I recommend you checking out her shop and seeing if there’s something there to suit your style, or for someone on your gift list. RECLAIMING AMY has some beautiful handbags available for purchase in her shop . Take a look. Amy has generously offered one living life one day at a time reader a chance to win a beautiful handbag. Thanks Amy! • Visit RECLAIMING AMY, and then leave a comment here telling me which handbag you like best. 2. Subscribe to my blog via reader. 4. Tweet about this contest on Twitter. *Enter by 9pm (EST) on Friday, December 5. One lucky commenter will be chosen at random and notified via email, so make sure you leave a valid email address in your comment. Gold Shimmer Medium Bag! I love the country look of it. The purple fancy print medium bag is very pretty! I like the Purple Fancy Print Medium Bag! Purple is my favorite color!! i love the purple fancy print bag! I love the Gold Shimmer Medium Bag-so lovely! I love it. I buy a ton of Vera Bradley bags between my teen girls and I. This could be shared amongst the 3 of us. Oh.....and I blogged about you. These bags are too cute...I liked the Autumn Colors the most, but I really like all of them. Thanks for being so generous. I like Autumn Colors Big Bag. Thanks for a great giveaway. Good luck with your Etsy shop, Amy! What a great site!! I love the "Blue Flower Print Big Bag". Thanks for the giveaway!! The Gold Shimmer medium bag is perfect for my holiday shopping! Purple/Black Paisley Medium Bag would be my favorite since there's no pink bag :) Thanks for entering me! I really like the Autumn Colors Big Bag! Thanks! Love these bags! My vote is the Gold Shimmer Medium Bag. So creative! I like the Gray Plaid Big Bag. That Autumn Colors bag is a cutie! She makes some great looking things! Wishing Amy the best. Gorgeous bags! I like the Purple/Black Paisley Medium Bag best. I like the Autumn Colors Big Bag, I still have a need for a diaper bag, but sometimes wish I could carry a purse. This looks big enough to satisfy both. I like the Black and Tan Paisey, very cute! My favorits is the Autumn Colors Big Bag. Very cute with a retro touch. I love purple so the Purple Fancy bag is by far my FAVORITE!!! Oh I really like the idea of re-using things. My favorite bag is Fuzzy Zebra Medium Flap Bag. This is so me! I like the Purple/Black Paisley Medium Bag. Hard decision but I think I like the Jewel Tones Paisley Print Medium Bag best. 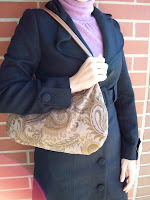 I love the Jewel tones Paisley print medium bag. Autumn Colors big bag!!!! It is great! I love the handles! Great Shop! I love the Gray Plaid Big Bag! It will go with just about anything. Thank you for the opportunity. The Purple/Black Paisley Medium Bag is too cute. Thanks for the giveaway!! Purple fancy print medium bag! Purple is a really big color this season! I also LOVE handbags! I think the Purple/Black Paisley (medium) Bag is my favorite! I love prurple, it really is a great fall color! 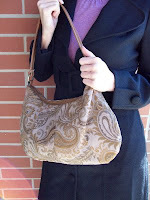 I like the Autumn Colors Big Bag and the Jewel Tones Paisley Print Medium Bag. I love that these are "recycled" , and she uses old belts for straps. So great! I love the Autumn Colors Big Bag. Thanks! I love this idea! what a awesome concept! I fell in love with the Gold shimmer bag! I love the gray plaid big bag! I love the concept of upcycling and repurposing and I think these bags are awesome! I'll be bookmarking and checking back for new stuff regularly. The Autumn Colors Big Bag is definitely for me. I like the big autumn colors bag. I like the autumn big bag. Thanks for the great giveaway. I really like the Purple/Black Paisley Medium Bag. Very nice. Thank you! The Purple/Black Paisley Medium Bag is cute. Thanks! I love the Autumn Colors Big Bag! It's so classic looking, but the design makes it so unique! The Autumn Colors Big Bag would be great to me! Thanks!